Jill McLean’s studio at the Zhou B Art Center in Bridgeport is a busy place these days. 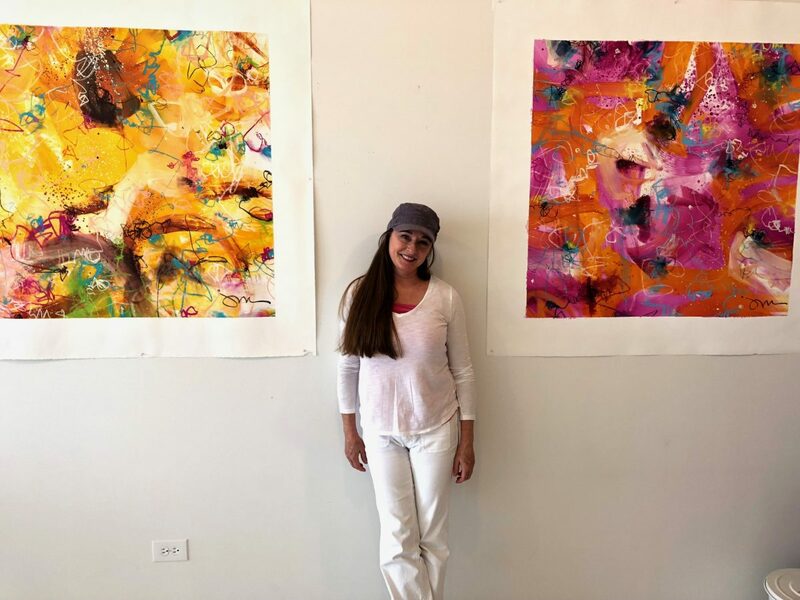 The abstract painter is usually there at least 8 hours a day, adding to her repertoire at a fast pace to keep up with demand — which has increased over the years based mostly on word of mouth and the monthly shows the art center hosts. For McLean, who grew up in Orange County, California, Chicago has been home for almost 20 years (not counting a brief return to California) and art has been her life. After working 25 years as an independent graphic designer while building her art practice in the evenings, Jill finally took the plunge to focus on her art full-time in 2010. She has been successful, which to her means being able to work full-time as an artist, because of her goal-orientated work ethic and entrepreneurial spirit. The Chicago Ambassador’s Bob Chiarito visited McLean at her studio on the 4th floor of the Zhou B Art Center — perhaps the city’s most chic arts studio buildings — to talk about her journey and her work. CA) After leaving your job and making the leap to focus on your art full-time, what convinced you that you were a professional artist? MCLEAN) I always believed it, so the belief system was in place. I think when we’re younger we are more influenced by people saying, ‘You should do this’ or, ‘This is a smarter choice for you because you have to make a living,’ but I’ve always had an entrepreneurial spirit. Even when I was a little girl, I always knew I’d have my own business. That whole dynamic was always there, it was more about logistics. I had to be smart about things and wait for the right timing. I knew I had to be a professional artist. I couldn’t ignore it because I knew I’d be unhappy if I continued to work in another industry without doing my art as a professional endeavor. Very quickly, the dynamic changed where my art was my full-time thing and it was a serious job and you go to the studio regardless if you feel like going or not. You always show up. I was made to do this. CA) Everyone obviously works in different ways, but it sounds like you have a set routine? MCLEAN) I feel like there’s a lot of room to play. Especially when you’re an entrepreneur, there’s a lot of room to experiment, you can make your own schedule. I do my best to honor that, because we have a different level of requirements to be regenerated creatively. So, if I’m constantly working and I don’t take a break, I’m wasting my whole day working against something. I’m a believer, and it took awhile to establish this, I’m a believer in being disciplined, because that is how you make a business. CA) Doing the work itself creates inspiration. MCLEAN) It does, it regenerates itself. If you just act. It’s like washing the dishes, just get it started. MCLEAN) Yes, that’s so true. I believe that. We all, especially in the creative fields, belong. It’s a privilege to belong in the art world and it may sound like I’m talking about the institutional but I don’t mean it that way. I mean it as a whole, the arts are so central in history. You cannot separate humanity from art. I agree with what you said, we all have different things that we need in order to convince us of that. For me, it’s being able to interact with other artists. It’s not just about the professional aspect, it’s not just about selling a piece or working on submissions. It’s really important to have that sense of belonging. CA) Do you get inspiration from the other artists? MCLEAN) Absolutely. I don’t depend on them for it, but I always know that even just having a conversation, not even seeing anything visually, is a source. I think that’s very common, I don’t think I’m alone in that. You have to be deliberate, go to see other people’s art. Even if I’m not crazy about it, there is always something to be informed about. CA) I saw your artist statement on your website about creating life. That was pretty interesting. MCLEAN) It’s all about creating life. I’m only speaking for myself, but it’s very known that in order to grow as an artist, you’re always fine tuning your work and what your purpose is. Sometimes it takes a long time to arrive at that ‘aha moment’ in terms of your work as a whole, not just a piece. For me, I remember when I first started and was writing my artist statement, which is sharing what your art is about, it was all about beauty and light and renewal. Those were the three central elements and it’s all very spiritual. In essence it started there, but then it evolved. I’m Catholic and I have a strong underpinning of my faith. I don’t push it on anyone but am bringing my way to the mix. Recently, I recognized my artist statement is about creating life and my love story with creation in every aspect, whether it’s actually creating an artwork or exchanging words with a stranger that improved their day. I’ve somehow moved humanity in a small way from the culture of death and created life instead. CA) You do seem like a very positive person with a sense of gratitude. MCLEAN) I have a huge amount of gratitude. For more information on Jill McLean, click here. Also, see her in studio #410 every third Friday of the month at the Zhou B Art Center open house at 1029 W. 35th St. from 7 to 10 p.m.